In large bowl, combine sour cream, chicken broth, onion, ground mustard, salt and pepper, mixing until smooth. 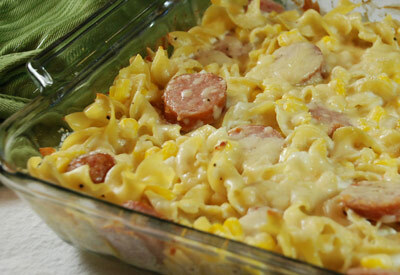 Fold in sausage, cooked noodles and corn. Pour mixture into a greased 13x9- inch baking dish. Cover and bake 25 minutes. Uncover, sprinkle with cheese and bake 5 to 10 minutes longer or until heated through.